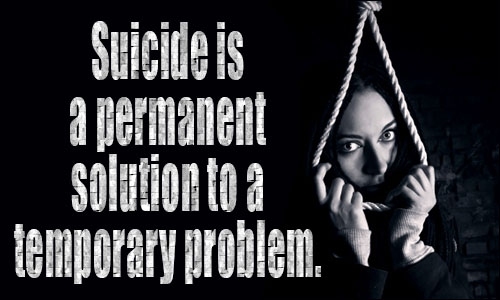 Committing suicide is a common issue of our society. Depression and lack of love or attention are the main causes that lead a healthy person to suicidal thoughts. Though it seems hard but with the love of people around and one’s own strength, such negative thoughts can be overcome. Here we have some suicidal thoughts quotes expressing what it feels to face a situation like it and the ways to get on with life. The critical time when you think that you can't handle it anymore. When disappointment overtakes your thoughts! Problems are temporary. Don't take hazardous steps like suicide as a solution. Suicide! I have been thinking about it. Don't cheat yourself out of your chance at existence. Thinking of suicide may be consoling for some broken souls. Hardships of life weakens down even the strongest people. Suicide at a young age is nothing serious. The thoughts of ending my life have long been haunting me. People commit suicide to stop the pain. Suicidal people seriously need our help! At some point of time we all have suicidal thoughts. It's so hard to be torn between such deadly thoughts. These dangerous feelings must be healed. Suicide not only kills the victim but also wounds the people around. Take hold of the creative extremes instead of the emotional extremes. Do not hurt others to the extent that they think of suicide. Suicide is a chance of putting my pieces back together. Choose life or death, the choice is yours! Suicide does not end the pain. It transfers the pain to the people left behind. Suicide eliminates the chances of a better life. World is a better place with you in it. Let's hope these suicidal thoughts quotes would help you find the purpose of your life. Give a thought to those who are left behind. Wait for the turn of the tide, no matter how long it takes. The bravest thing to do! Embrace your abilities to recover and achieve. This is it! You can find many people and things worth living for.